And my nomination goes to.. If you had to pick one aspect of your Crohn's that is the worst, most debilitating thing what would you choose - "PAIN"? "LETHARGY"? "DIARRHOEA"? Some other physical aspect? There could be many more suggestions as each of us is affected by this disease in different ways. Short term - the day-to-day, sometimes hour-to-hour question - is my digestive system going to behave or will I be dashing off to find the nearest bathroom. I might have been fine for months but there is always that nagging doubt which can turn to anxiety, especially going on a long journey by public transport, and then it becomes self-perpetuating. I've tried "mind over matter" - it doesn't always work. Distraction is my best ally but not always easy to achieve. Long term - as I have found out, the drugs can stop working and surgery beckons. Having had surgery once I was hoping I wouldn't need it again. Wrong. So lurking in the background there is always that possibility of needing further operations and the disruption that entails. Ending - a while back I asked my consultant what my ultimate prognosis was. Should I expect my lifespan to be reduced by Crohn's. He considered the list of conditions I've ended up with and said "It won't be the Crohn's that kills you!" Well that was reassuring - for about a second. I would characterise my view of Crohn's by saying that it adds further layers of uncertainity to the usual ones we call life. I've managed to bury three of the layers quite deeply and they only surface when I'm writing something like this post. I really don't wander around with a mind full of thoughts of flare-ups or surgery. The one that I just can't bury is the misbehaviour of my digestive system although an extra capsule of Loperamide can help! Bring me some "Certainty". Has this happened to you? You go to see your consultant and at the end of the appointment they say "I think you should get your bloods done" or some other test that involves taking a sample and then having it analysed. You then wait until your next appointment to discuss the results. This could be weeks or months.....or even worse you get a call to say you need to be seen straight away. I would rather get the relevant test(s) done just prior to the appointment so the results are current and the (anxious) wait to discuss them is reduced to a minimum. I put this to my consultant at the end of the last appointment in December. He agreed that it made sense to let me decide if and when I needed tests and this was especially relevant due to my ongoing concern about the ache in my side and unpredictable guts. He printed off the forms needed for calprotectin and blood tests (Liver Profile, CRP and a Full Blood Count). It's then been down to me to have the tests done in time for my scheduled appointment (23rd June) or sooner if my symptoms start to get worse. The ache (see previous posts) has been getting a lot more persistent so I chose to have the calprotectin test done at the beginning of May, earlier than I needed for my appointment. I really wanted to know if the Crohn's monster has re-awoken. 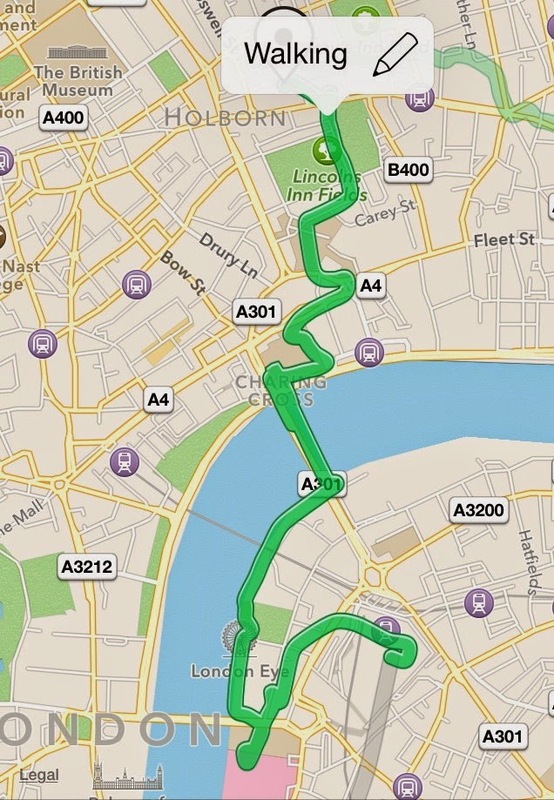 I took a slight detour on my walk to work and dropped a sample into the Path Lab at St.Thomas' Hospital. It was properly labelled with name, DOB and Hospital No. and had the necessary paperwork. So far so good. I left it 2 weeks for the test results to be sent to my consultant and then emailed him to ask if he could let me know what value the test was showing. 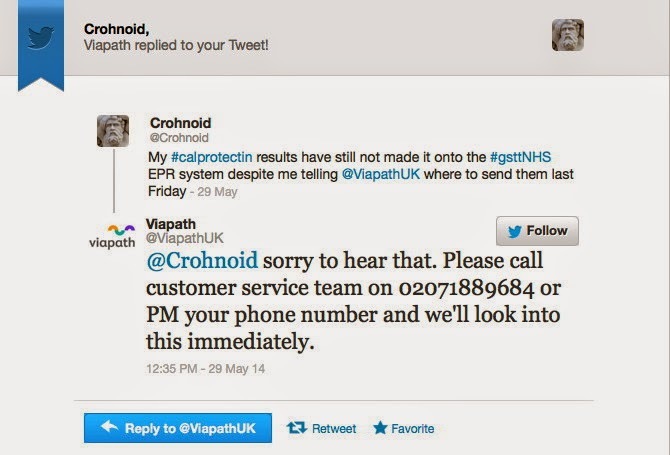 "Viapath, formed in 2009, is majority owned by the NHS, with the commercial freedom to invest in growth and innovation. A joint venture between Guy's and St Thomas' and King's College Hospital NHS Foundation Trusts, and Serco PLC - we aim to set the standard for the future of pathology." SERCO???? Was this some early, "back door" privatisation? The Viapath website had a link entitled "Ask Our CEO". Let's try it. I "asked" him if he could track down my test results. The next day I got a response from Customer Support saying that they were looking into the matter and then a little later on a further email telling me that they had tracked down the results! So that's all good, except "they didn't know where to send them", which was rather a feeble excuse given the paperwork that accompanied the sample. I can't believe they would carry out a test without knowing where to send the bill. Disclaimer: This is written based on my Crohn's, the way it deals with me and I deal with it. We all suffer in our own way, your experience may be totally different from mine.